By Sam Aybar on June 16, 2017 . The Runscope UI provides a lot of flexibility for our customers to monitor and test APIs. You can easily manage the tests you have written, whether that means exporting them, duplicating them, or moving them to a different bucket. Sometimes, however, our customers want to do something that we don’t have built-in. This is where the benefits of having a robust API come into play. For example, one customer recently expressed interest in being able to export an environment for backup purposes; another customer wanted to copy a shared environment to a different bucket. Environments are one of the key elements in creating reusable API tests, especially when it comes to testing local, staging, and production APIs. This blog post outlines two example Python scripts to address these needs of importing/exporting environments. You can find these scripts at Runscope/runscope-api-examples. Feel free to fork/modify them to fit your needs. The first script -- runscope_export_env.py -- allows you to export a Runscope Environment to a JSON file. The second script -- runscope_import_env.py -- allows you to import a JSON file exported by the first script. And then, it will save the results to a JSON file in the same directory as your script, with the same name as your environment. You can save this file for future use, modify it if you want to change it before importing to a different bucket, or simply move on to the next step to import it to another bucket. That will create a new shared environment in the bucket specified based on the JSON file previously saved. This environment will then be available to tests in this bucket. In addition to copying shared environments between buckets, these scripts can also be used to work with test-specific environments or to overwrite a shared environment. To access these advanced features, check out the README for the command line flags you can use to override the defaults. 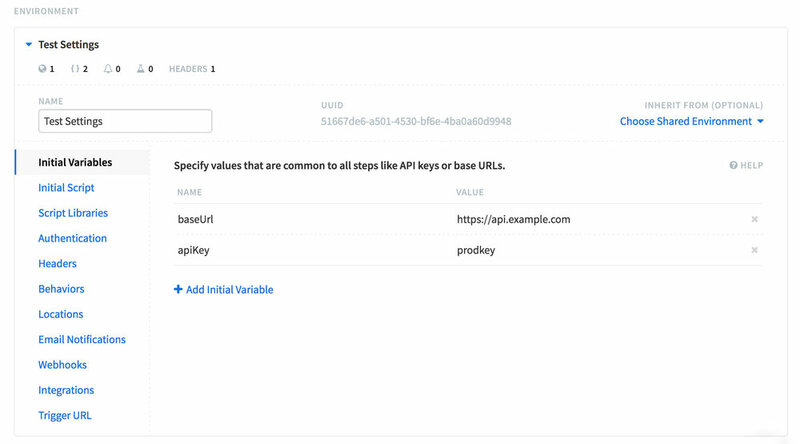 With the power of the Runscope API, we make it easy to extend our functionality on your own. If you have any suggestions on how we could improve those scripts, or other things you might want to do that we currently don't have built-in, feel free to open a PR in our api-examples repository, or reach out to our awesome support team!